Samsung has just announced the Galaxy A7, the company’s first smartphone to pack a triple rear camera setup. It’s part of Samsung’s new strategy of introducing new features on mid-range devices before bringing them to flagship smartphones. Well, the Galaxy A7 marks the commencement of Samsung’s new product strategy by packing a triple rear camera set-up before its debut on the upcoming Galaxy S10 flagship. 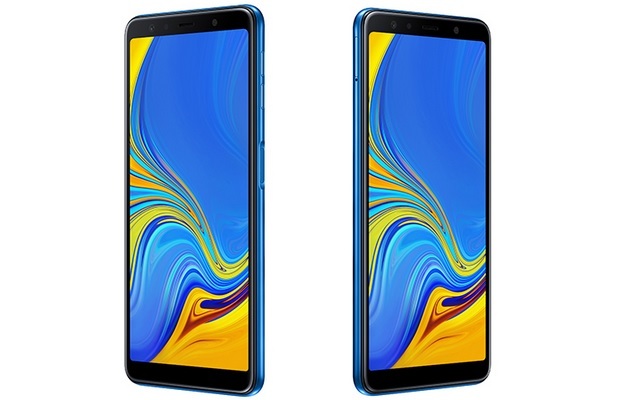 But aside from the impressive imaging hardware, the Galaxy A7 is a pretty decked-out smartphone in terms of hardware, and also comes with a host of software tricks such as Bixby AI assistant, Dolby Atmos audio, Samsung Pay and Samsung Health among others. The Galaxy A7 will be available in three models: 4GB + 64GB, 4GB + 128GB and 6GB + 128GB. The availability of the Galaxy A7 variants will vary in different markets. Moreover, Samsung has also revealed that the octa-core 2.2GHz processor packed inside the new smartphone is variable, which means different markets will receive Galaxy A7 variants that are powered by different processors. The Galaxy A7’s imaging hardware is backed by camera features such as Live Focus to control the depth of field effect and adjust bokeh variables. There is also a Scene Optimizer functionality which allows the camera to automatically identify the subject, tweak the color profile, contrast and brightness values to deliver superior quality images. The 24MP front camera too comes with features such as Selfie Focus, Pro Lighting Mode and AR Emojis among others. Samsung has not revealed the Galaxy A7’s pricing and has only disclosed partial information about the markets where the device will hit the shelves later this year. We’ll keep you updated once Samsung reveals the Galaxy A7 price for the Indian market. The company’s official blog post states that the Galaxy A7 will be available in ‘select European and Asian markets’ in the fall season later this year. However, the company has not specified the names of the countries where the device will be available, which means we can’t be sure if, or when, the Galaxy A7 will hit the shelves in India. We checked for the A7’s listing on the official Samsung India website and could not find any details about its availability yet.